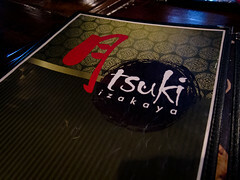 Located in J-Town on Steeles north of the city, Izakaya Ju is a popular izakaya for those who live in the Markham and Richmond Hill area. 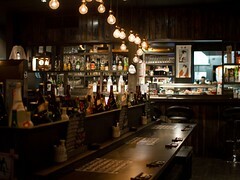 Atmosphere: I was surprised walking into the restaurant how small it was because they accepted reservations. We had a big group and took up about ¼ of the chairs. Ceilings are high and the interior has an unfinished, industrial decor. A large chalkboard, with the specials written out, occupied an entire wall. The kitchen is open to the dining area so at times the smoke from the charcoal grill did get heavy, however the high ceilings helped ventilate. Service: Nothing stood out particularly for service. For a busy night, it did take some time to clear empty dishes off our table and we often had to rearrange plates ourselves. During the time we were there, the dining area stayed packed. There were no long lines outside but guests did have to wait and some decided not to. While getting our bill, our server had a bit of a confusion separating it out for us but she figured it out with some help. 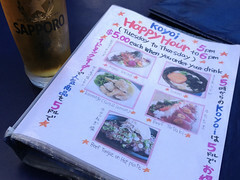 Food: As is typical of izakayas and large groups, we ordered a lot of dishes and were able to taste the bulk of the menu. I’ll start by going through what’s pictured and then list my must-try dishes. I missed photographing the skewers. They had a nice smoky flavour and charred coating. Marinated mackerel with daikon and scallions is a dish I always order at izakayas. This was well marinated and on par with other restaurants. The Teba Gyoza, a deep fried, boneless chicken wing stuffed with pork was very intriguing. We didn’t really know what to expect but it was exactly as the menu described, a dumpling using a chicken wing as the wrapper. Amazing concept, good execution. I don’t recall what the dish on on the right was (sorry!). The Summer Cold Noodles was a special menu item and is served cold with bamboo and soft boiled egg topping. 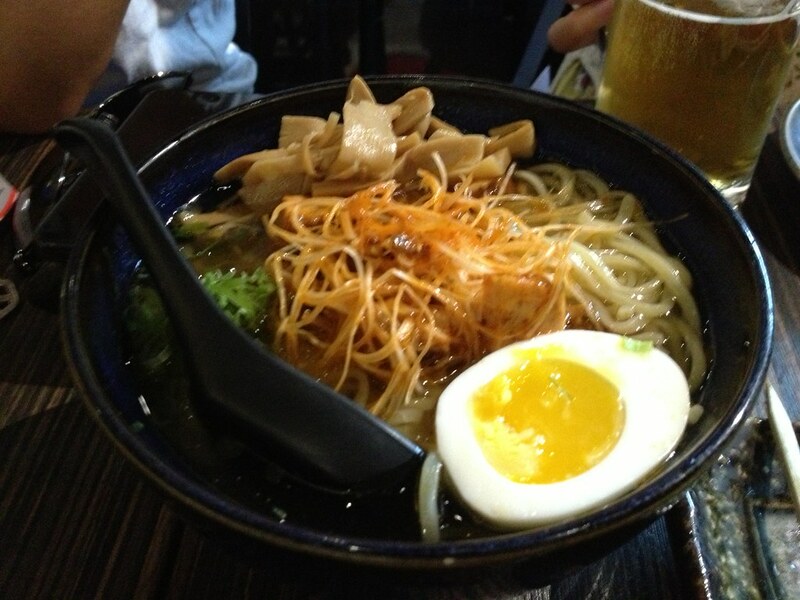 The broth was savoury and the noodles were a good chewy. 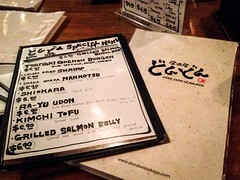 We also ordered the Osaka omelette from the special menu that was delicious. 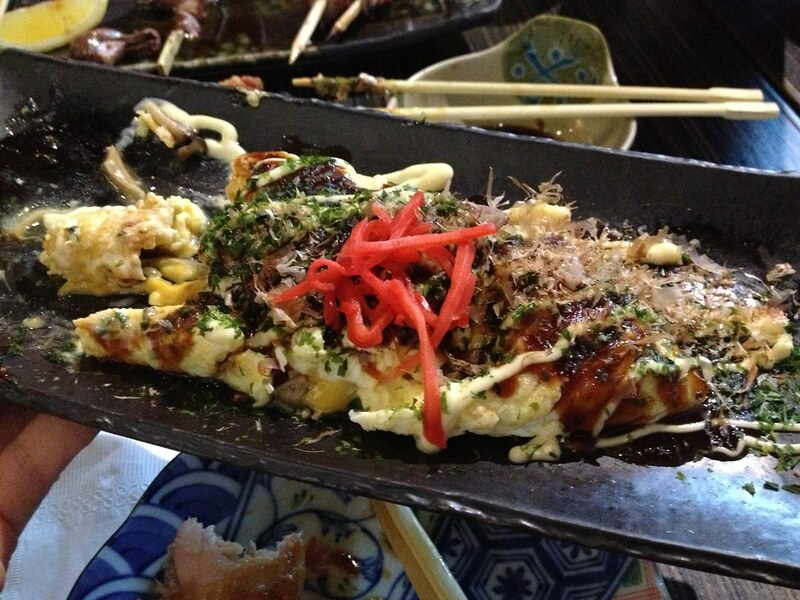 The eggs were cooked to just solid and covered with okonomiyaki sauce, bonito flakes, mayonnaise, seaweed and pickled ginger. 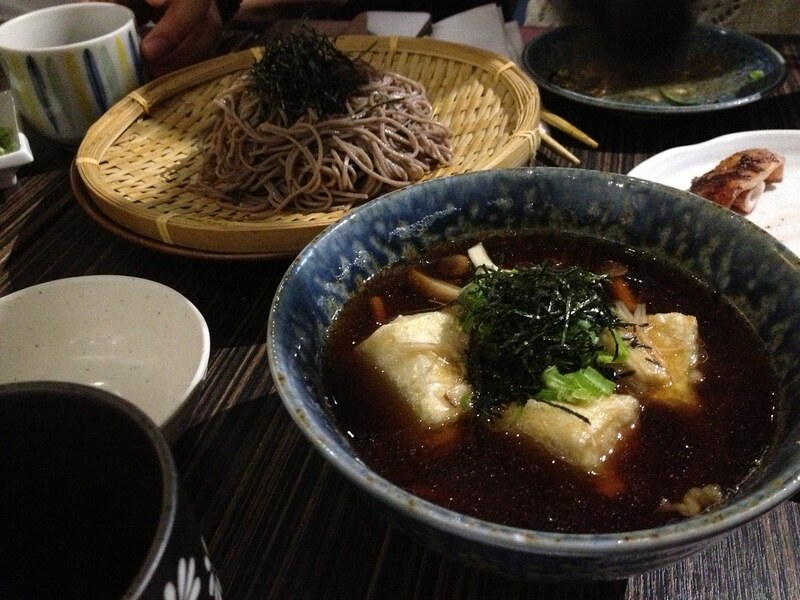 The fried fish cakes, soba noodles and agedashi tofu were pretty standard. 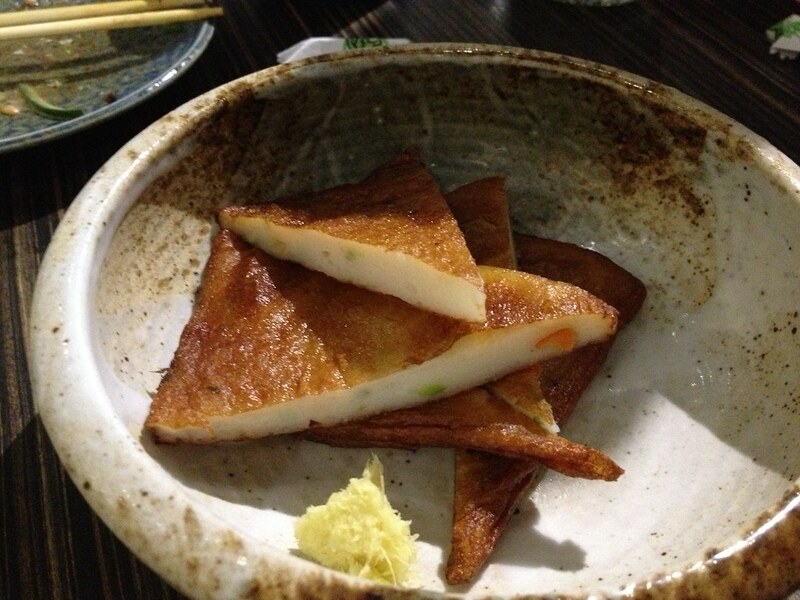 It was nice that the agedashi tofu was served with a lot of sauce. 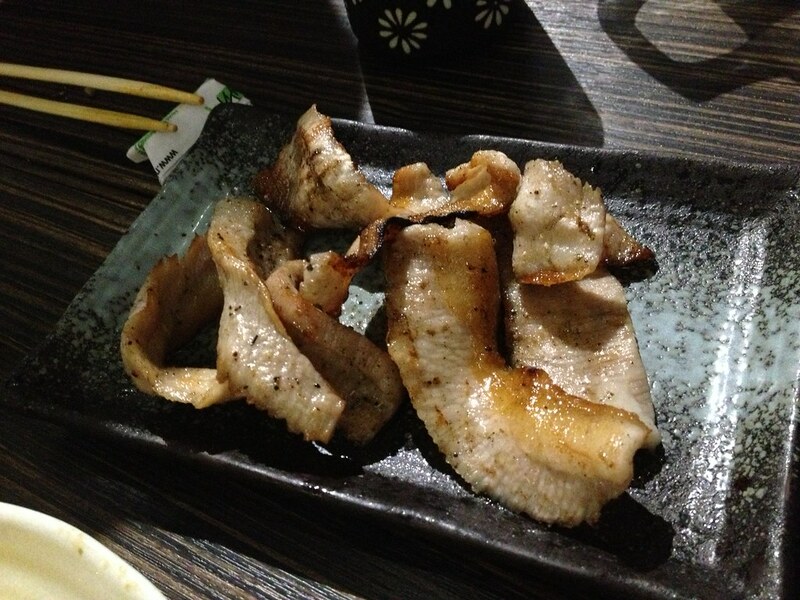 I really enjoyed the grilled pork cheek and we ordered multiple plates. The meat was flavourful, fatty and still tender. We saw the Osaka cha-han on another table and just had to try it based on the presentation. 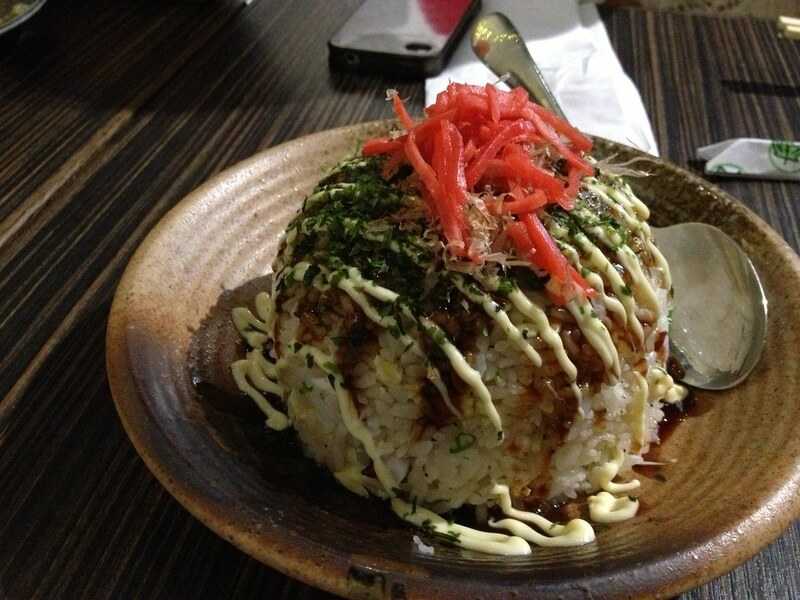 This was a fried rice with octopus, shaped into a giant ball and topped with the same toppings as the Osaka omelette. This was a great portion, great flavours and a hint of seafood. 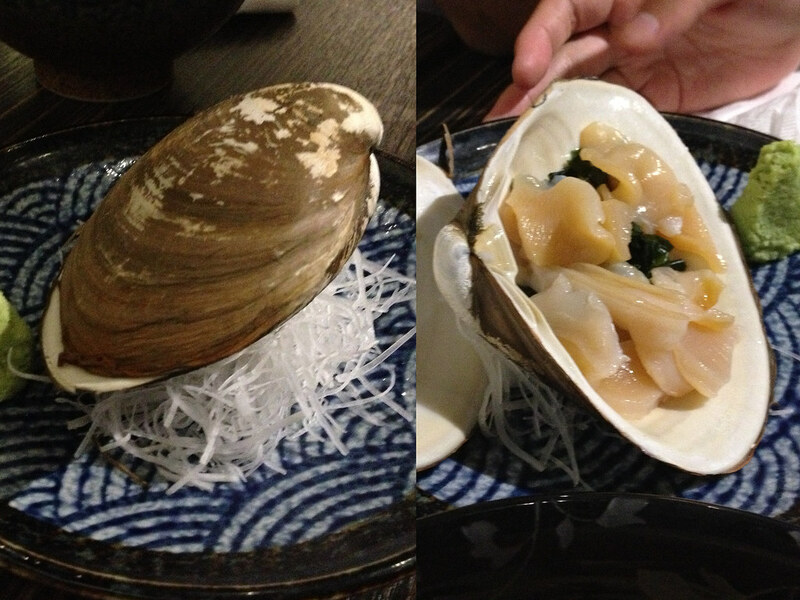 Lastly, the clam sashimi that was served in a shell. The presentation was cute and the sashimi was lightly seasoned. 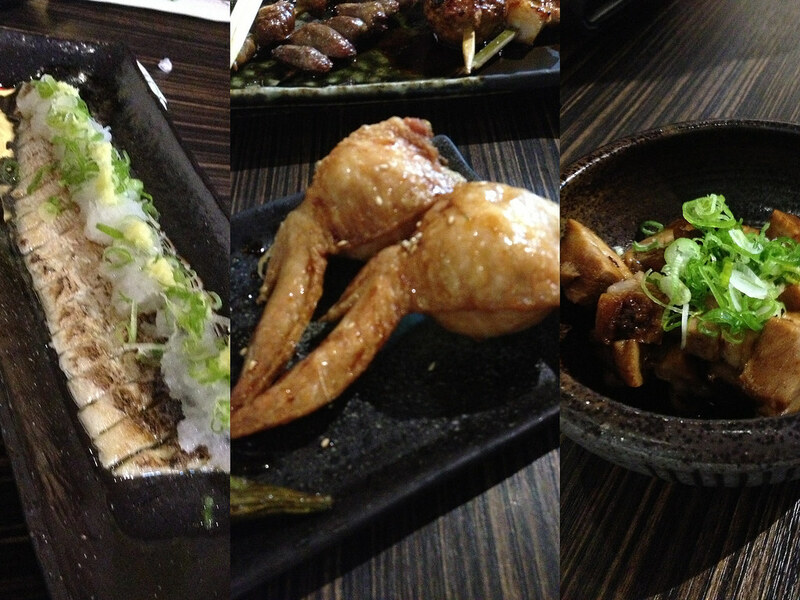 The dishes that made Izakaya Ju stand out for me were the Teba gyoza, the grilled pork cheek and the Osaka cha-han. 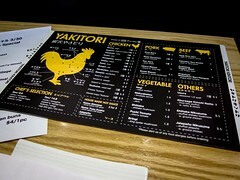 Their varying special, seasonal menu also offered some great choices that makes each visit worthwhile.